Walk around Myeongdong on a busy afternoon and you’re more likely to hear Chinese, Japanese or English than you are to hear Korean. One of the most tourist-filled neighborhoods in all of Seoul, Myeongdong is jam-packed with beauty stores, shoe stores, street food… and some more stores. It’s not difficult to get lost in the maze that it is and even more difficult to find something that feels uniquely Korean here–after all, isn’t that what you came here for? In this Myeongdong guide, find all the tricks and trades to getting in and out of the neighborhood safely. Which are the best restaurants that even the locals appreciate? Which street food venders should you avoid like the plague? And of course, we’ll also answer the question of how to find that Got7 poster you’re dying to get. Enjoy being a tourist–just eat at the best restaurants, don’t get ripped off and have some delicious dessert while you’re at it! When heading off to Myeongdong, many people mistakenly believe that they must get off at Myeongdong Station on Line 4 (light blue), but actually Myeongdong is located between there and Euljiro 1-ga Station on Line 2 (green). 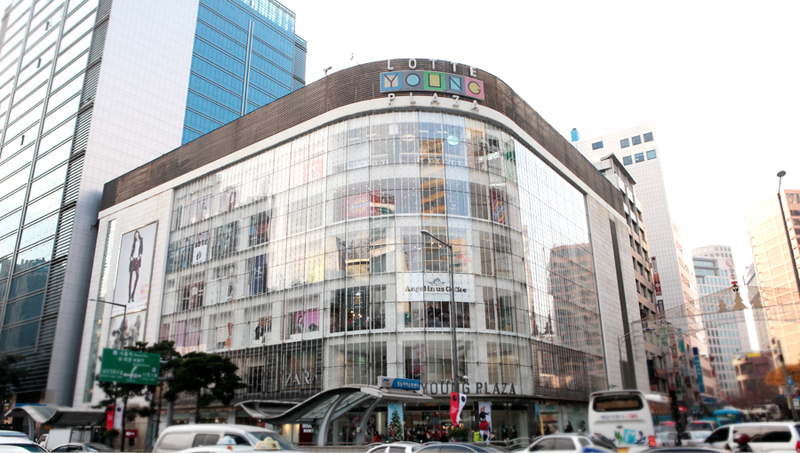 In fact, many of the most popular destinations of Myeongdong are actually located closer to Euljiro 1-ga Station. Exit 1 : Taking Exit 1 will lead you away from the main Myeongdong neighborhood and up Namsan Mountain. Exit 2, 3 & 4 : These exits are located across the street from the main Myeongdong Area. You can use Exit 4 to reach the entrance for the Namsan Cable Car. Exit 6 : Taking Exit 6 brings you into the heart of Myeongdong. To your left after exiting will be Migliore Mall. Exit 7 :Taking Exit 7 brings you into the heart of Myeongdong. To your right after exiting will be a multi-level Uniqlo. Exit 1-1 : This exit will lead you towards City Hall, passing at the Grevin Museum on the way. Exit 5 : After leaving Exit 5, make a right at Myeongdong 9-gil for the less crowded entrance to the main Myeongdong area. You can also continue walking straight for the Golbanggi (Sea Snail) Street. Exit 6 : After leaving Exit 6, continue walking straight until you hit Myeongdong-gil. Exit 7 : At Exit 7, you’ll be directly in front of the Lotte Hotel and Mall. Additionally, there is also a smoking area here since smoking in this area is strictly forbidden. Exit 8 : Walking straight out of Exit 8 will lead you towards City Hall. Tip : Myeongdong is also a popular stop on the bus route, but figuring out which part of Myeongdong is best for the bus can be a bit tricky. If you are heading north on a bus on the Myeongdong side, you might be taking a roundabout route with Seoul Station in the center. There is also the Paik Hospital bus stop closer to Myeongdong Cathedral if you are taking a bus towards Gangnam or outside of Seoul. 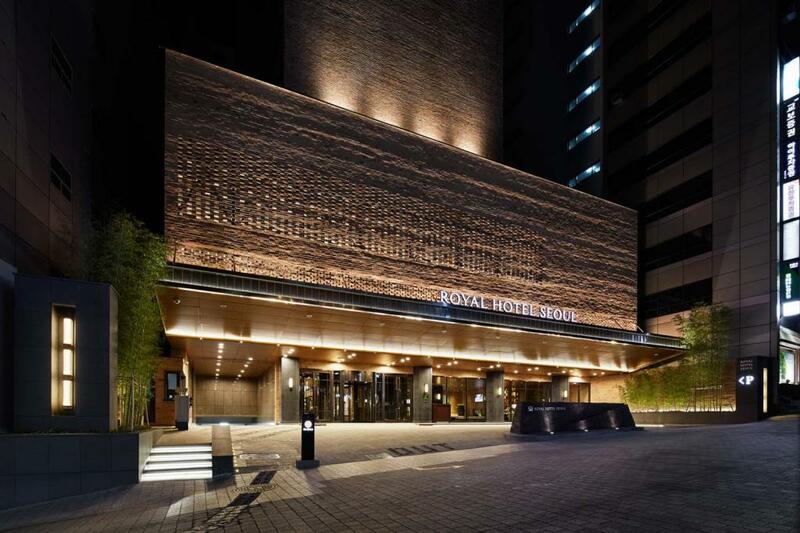 Located right across the street from Myeongdong Cathedral, this towering hotel has a majestic entrance to the only quiet part of town. Renovated not too long ago in 2016, this four star-hotel truly treats you like royalty–especially if you’re staying at one of their 19 suites. Additionally, the staff is noted for their detail to attention and willingness to help you a variety of different situations. 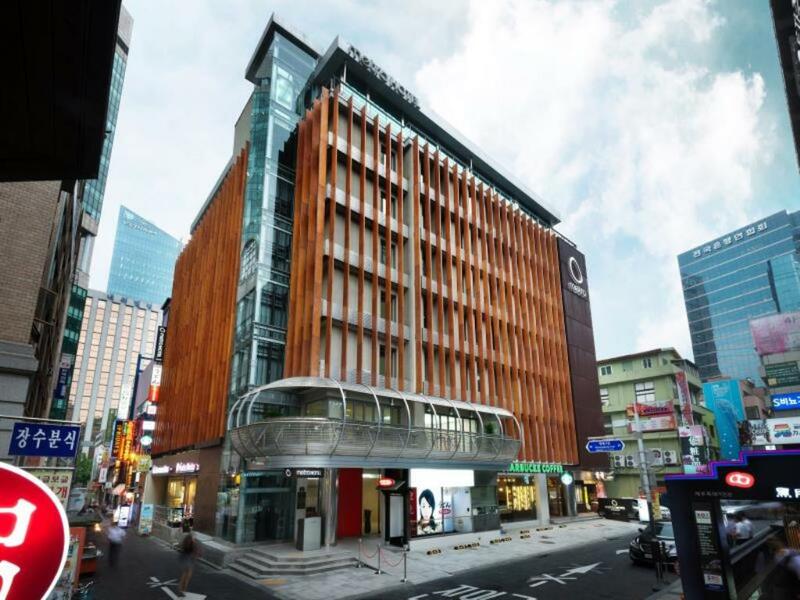 Metro Hotel stands out among the hotels in Myeongdong with its unique wooden, spiraling exterior and bright green and purple brand colors. Despite the fact that it’s a 3-star hotel, you are provided with all the high-end quality amenities. There is a small children’s room where restless children can jump around and a communal area for those that may feel their room is too small to eat in. One of the most talked about hotels in the past few years, Small House Big Door has been at the forefront of minimal chic. 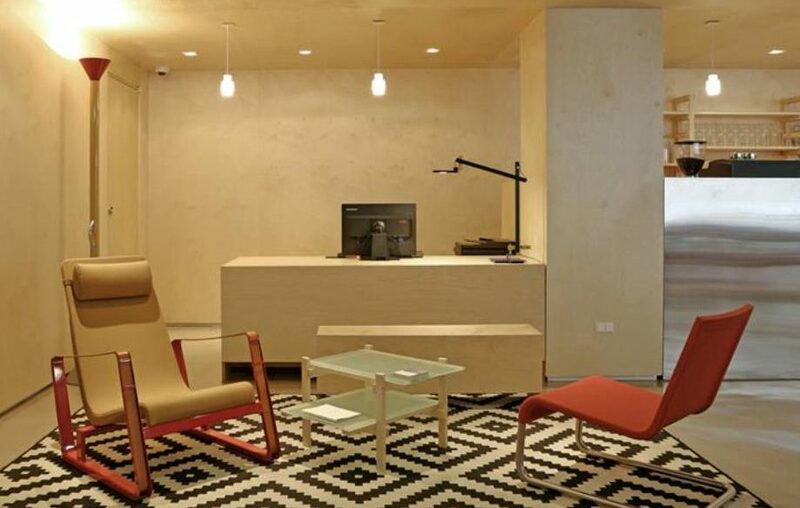 With an all-white interior, this Myeongdong hotel is almost what would happen if the Apple company decided to start a hotel chain–simple, clean and no fuss. The large double beds are practically designed for couples, but you can also come with a close friend you’re comfortable hitting the sheets with. During the summer, the hotel also hosts a few very hip parties on the roof. 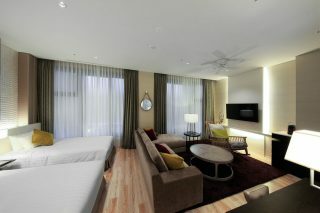 This Japanese brand hotel has an unbeatable location in the middle of the main Myeongdong area. It’s also brand new, so you’ll get all the perks of Japanese cleanliness and attention to detail. Come here if you’re willing to pay a little more for more comfort while still having a better location than some of the other more expensive hotels in the area. 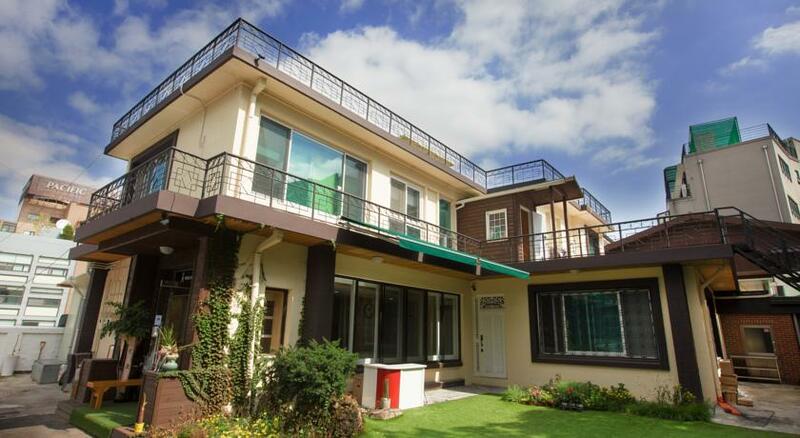 A cozy house located on Seoul’s most talked about mountain, 24 Guesthouse Namsan Garden is a great option for a traveler on a budget whose main motive is to stay central. With both single rooms and single economy rooms, often under $50 a night, solo travelers can afford to have their own space without spending too much money. The small garden out front and the spectacular breakfast here make it one of the most loved Seoul guesthouses by travelers. (명동교자) Although Myeongdong Gyoza is a multi-level restaurant with two different locations in the neighborhood, both of them fill up during lunch and dinner. The restaurant’s most famous dish is kalguksu (knife-cut noodles), but it is also famous for its bibimguksu (spicy noodles with vegetables) and kongguksu (noodles in cold soy milk broth). But if you’re checking out this famous Myeongdong restaurant, you can’t just get a bowl of noodles; you have to order the dumplings too. The steaming hot dumplings are a perfect pairing with the silky smooth noodles. Unlike most kalguksu restaurants that have an anchovy base, they use a beef-base­ and the soup can be a bit on the salty side. Rumor has it the saltiness of the broth is to keep you from gorging on the restaurant’s delicious kimchi. The kimchi’s packed with garlic and extra pungent. Order some rice and don’t be fooled into cutting back on the kimchi! This is a popular chain galbijjim restaurant in seoul with locations all over the city. 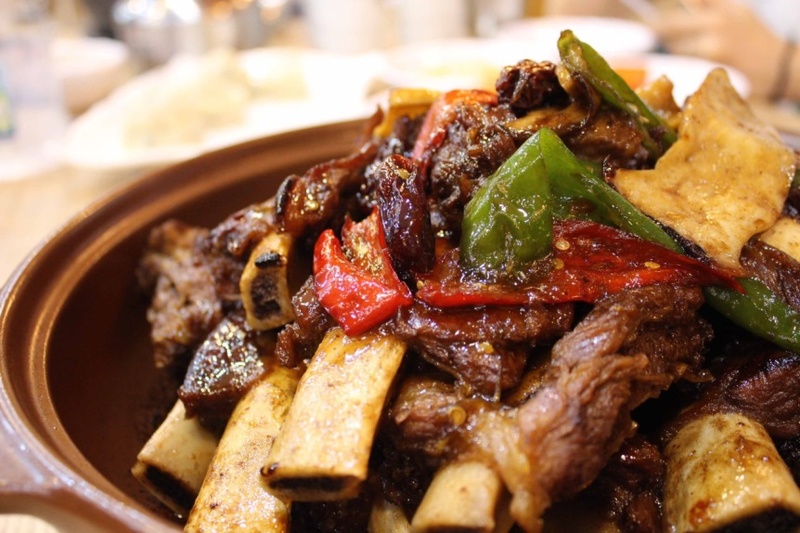 It’s well-loved for one dish in particular–galbijjim (braised short ribs). Here, the tender meat almost falls off the bone and the marinate pairs perfectly with the mulnaengmyun (iced buckwheat noodles) also served in store. 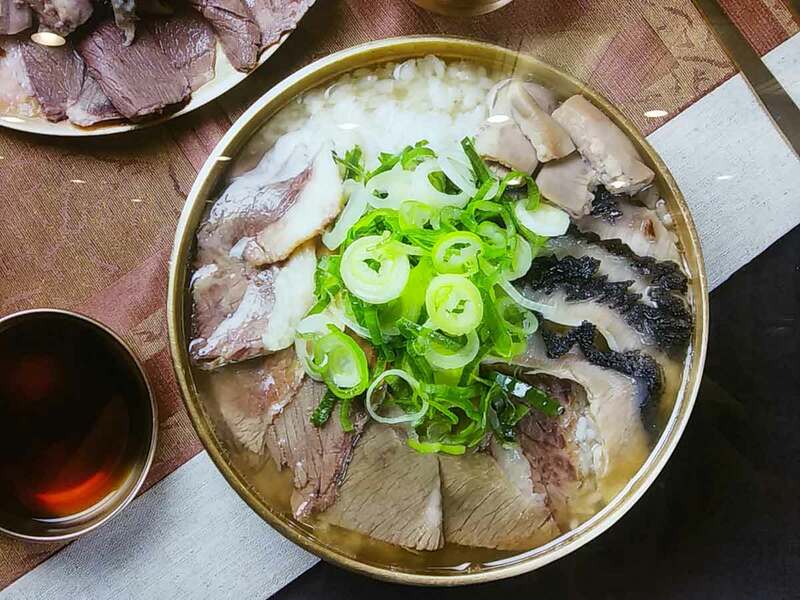 (하동관) One of the most famous restaurants in Korea, much of the restaurant’s claim to fame is a story that involves President Park Chung Hee in the 1970’s: When he was away on a trip to Jeju Island, he requested a bowl of gomtang (beef broth soup) to be flown down for his breakfast. He probably missed his grandmother’s cooking. And that’s the exact reason Hadongkwan is so famous; it reminds them of their grandmother’s cooking. While the dish is just beef broth, rice and slices of beef, the soup here is special. While most gomtang restaurant soups are cloudy, Hadongkwan’s is filtered for a clear, heart-warming and refreshing taste. And even with all that extra work, it’s still that home-style Korean comfort food that really sticks to your bones on cold winter days, or when you’re sick. It’s the type of soup that makes you feel loved. 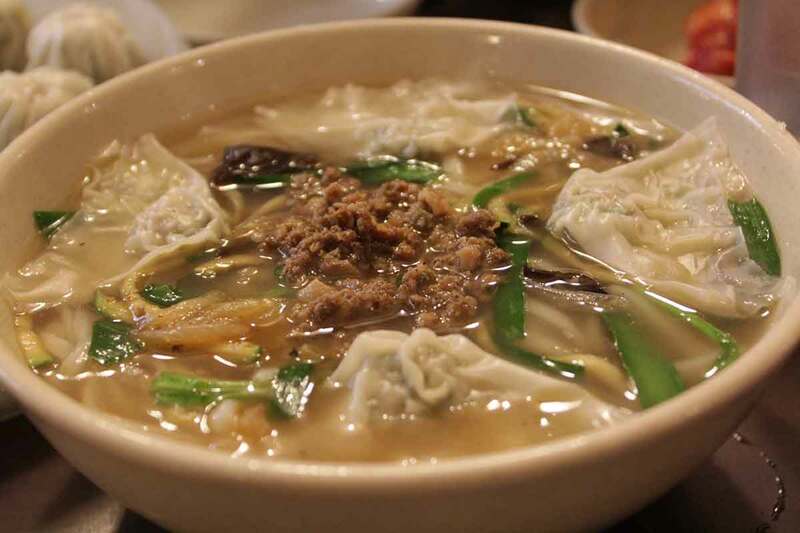 The gomtang is available in two different varieties–regular and special (special includes slices of tripe). Be wary of the lunchtime lines, the open times and the days they’re closed. Note: There’s another Hadongkwan in Yeouido. (부민옥) Open since 1956, Buminok’s longevity points to something–if not to its delicious dishes. 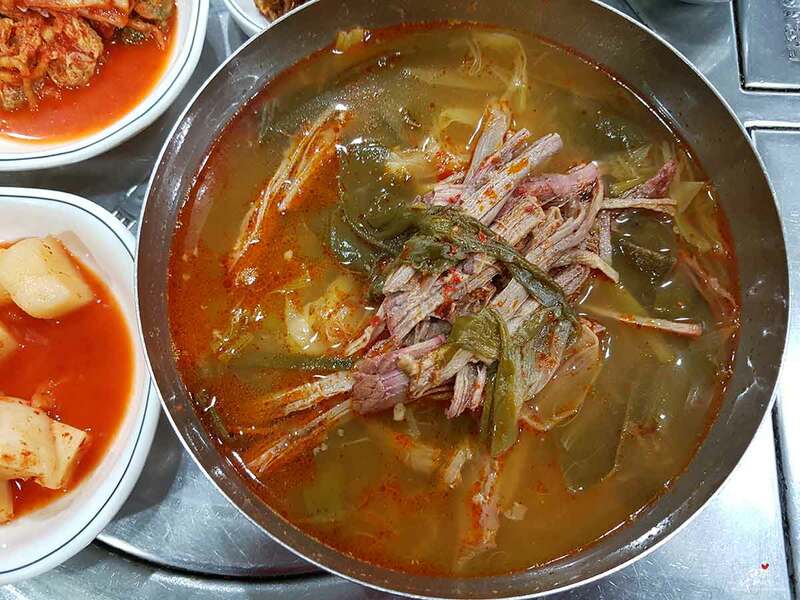 While there are large sharing dishes here like spicy, stir octopus and jeon (Korean style pancakes), one of the reasons that this famous Myeongdong restaurant continues to survive is its yukgaejang, a spicy beef and vegetable soup that most restaurants serve haphazardly. Here, each ingredient is well-prepared, even before it’s heated up and the final product is a careful balance of savory and sweet­. (남산돈까스) If you notice a long line at a hole in the wall restaurant on your way to Namsan Tower, chances are you’re looking at Namsan Donkkasu or one of its copycats. 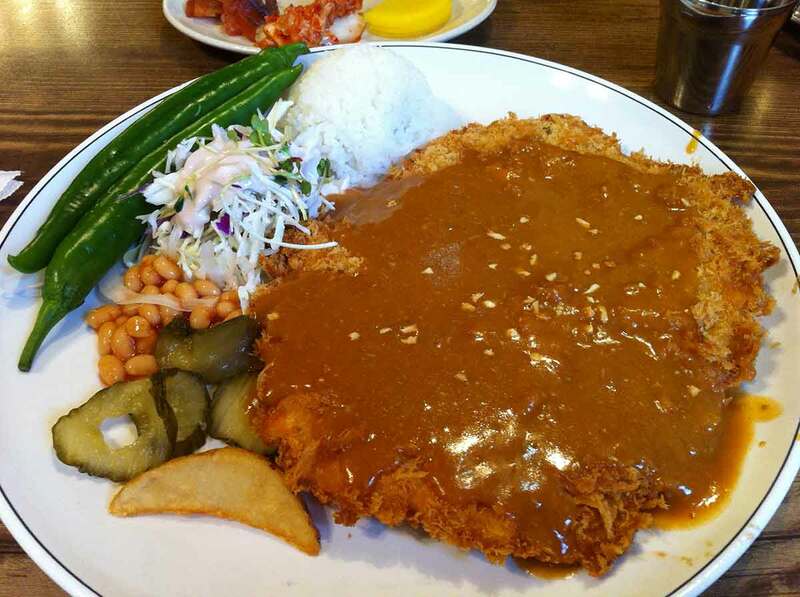 Their donkatsu, deep fried tenderloin (or your choice of fish or chicken), is extra crispy, and the portions very generous, this famous Myeongdong restaurant has been a longtime favorite of cab drivers and nearby office workers. Each dish is served with a bit of Korean-style side salad, beans and pickles for those looking for your daily dose of veggie and iced soba as a possible add-on. On weekends, especially when the weather is nice, parking for this restaurant in Myeongdong becomes a real battle of the wills. A multi-section establishment, YG Republique was made for K-pop lovers, but that’s not a knock on the food. There are three different restaurants: a meat-themed restaurant called Samgeoripujutgan (or Three-way Butcher), a salad café named 3Birds and a pub called K-Pub. And although they’re focused on Kpop, this samgyeopsal restaurant in Myeongdong is still loved by local office workers looking for some pork and beer after work. And if you do happen to be a kpop lover, you can get a YG product along with your order of pork! 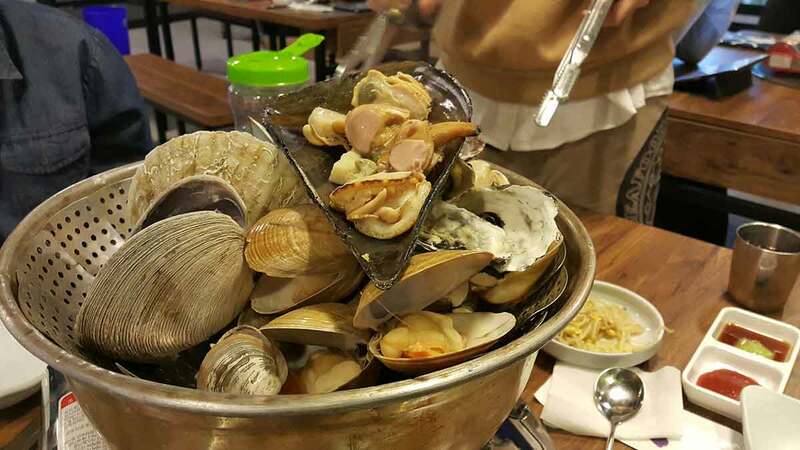 Right out of Euljiro 3-ga Station (Exit 12), the Euljiro Golbaengi Street isn’t necessarily a favorite of tourists and the sea-snail dish served here, golbaengi mochim, is an acquired taste to have. However, you’re adventurous and love spicy food, this is definitely a good off the beaten track experience to have. 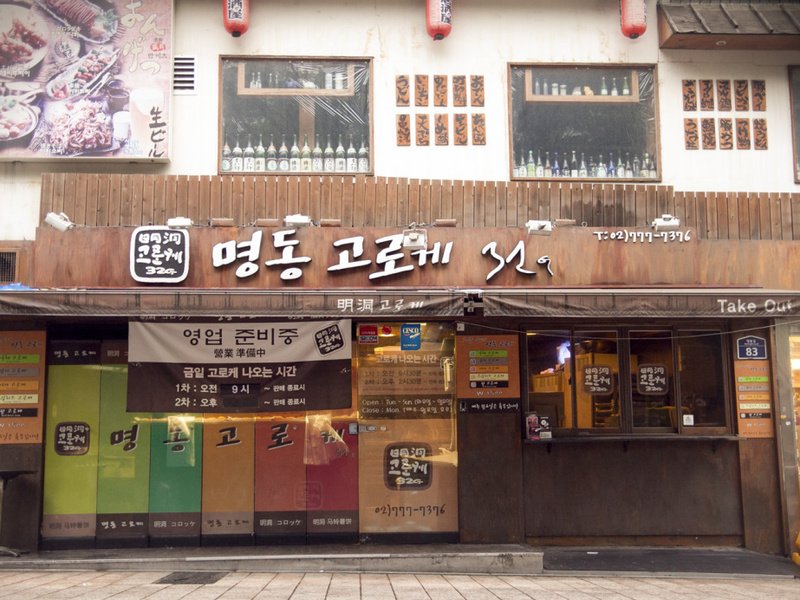 Three or four restaurants have both indoor and outdoor seating, all serving golbaengi with soju or beer. You definitely don’t see any tourists around! 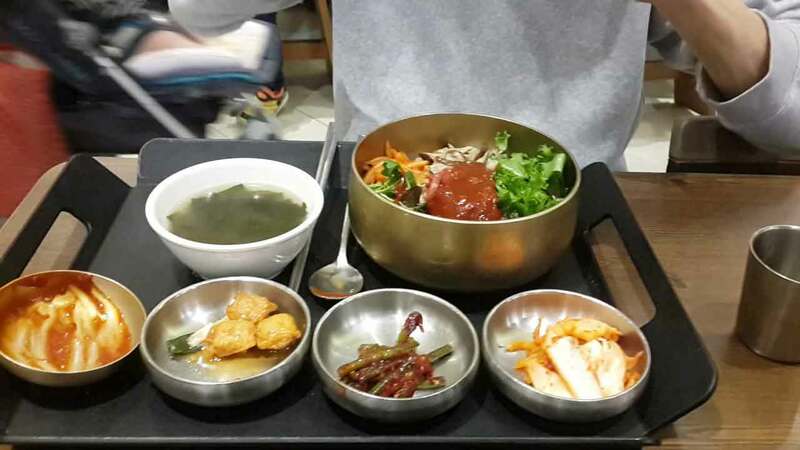 If you’re wondering what to eat in Myeongdong and need to see the food before you step in, try the food court in Lotte Department Store. 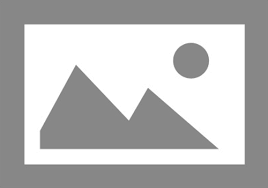 This food court has become famous for its wide selection, high quality and affordable prices. They have a collection of different food vendors that have become famous with their own restaurants throughout Korea. Also, their variety is insane. In addition to all different types of Korean food, they have sushi and Japanese rice bowls, spicy Thai noodles and even American style Chinese food. Best of all, the food is clean and very affordable. Even though this is a high-end luxury department store, if you come to the food court around closing time (7PM), you’ll hear what sounds like a throwback to a traditional traditional Korean market with aunties yelling to sell all their food items at a discount. Most of the time they’re saying “3 packages for 10,000 won,” and that’s a deal! Tip: Stop by the Lotte Department Store supermarket for delicious foods you can take home. Too full for a sit-down meal? Need something to tide you over until dinnertime? There are plenty of snacks and desserts to fill your stomach and because of the high influx of Japanese tourists, many of the eats are Japanese or Japanese-inspired. Here are all the places that are worth seeking out. Across the street from Myeongdong Cathedral, lines in front of this street vender start well before the stand’s open times. Croquettes are sold in five different variations­–potato, vegetable, red bean, cream cheese and mustard. The cream cheese is always one of the first to be sold out, so if you happen to see it–get it quick! Each croquette is only 1,500 won so you can also feel free to try all of them out for a grand (but greasy) meal. 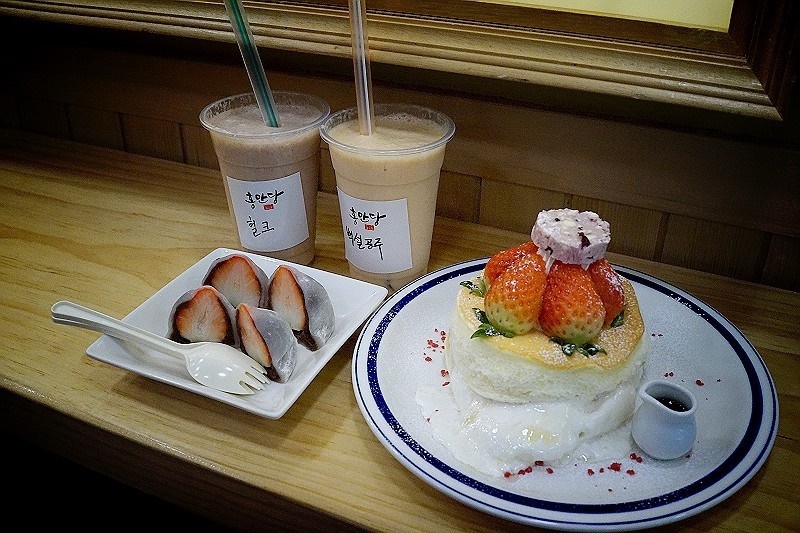 Although this small dessert shop and café boasts itself as a strawberry-themed shop, you can get a variety of drinks, cakes, pancakes and best of all, mochi (Japanese-style sweet rice cake) there. Mochi is available in several different flavors and hides your fruit of choice inside­–orange, grapefruit, grape, pineapple, tangerine, banana, cherry and of course, strawberry. Second only to the location in Insadong, the O’Sulloc in Myeongdong is likely one of the most atmospheric places to have tea in the neighborhood. On the first floor, you can order from the menu of teas and desserts (as well as browse in the gift shop) and there’s seating available on the first, second or third floors. There’s large table seating on the back of the third floor, but some prefer the second floor seating closer to the window for its airy feeling. The O’Sulloc summertime desserts are our some of our favorites so make sure not to miss out! A must-see for fans of the drama “Reply 1994,” Café Coin is definitely a veteran in Myeongdong’s café scene. 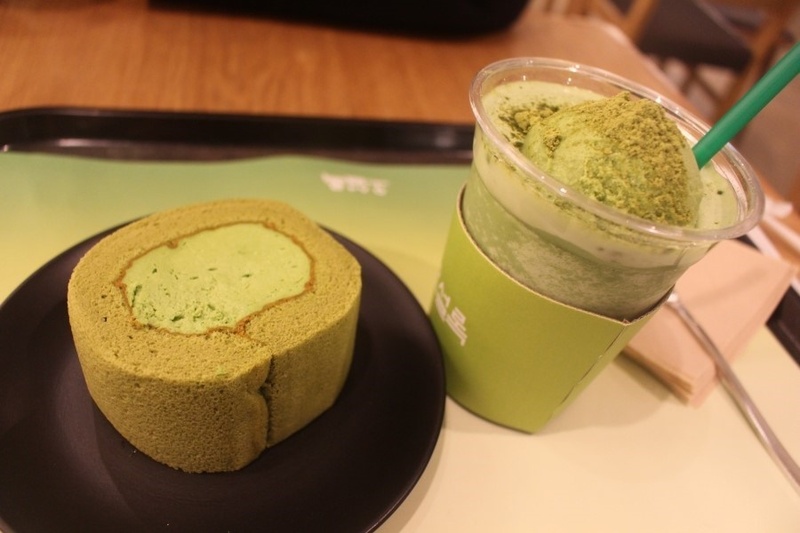 Coffee, teas and smoothies are served here but the café’s most popular item is definitely the bingsu (shaved ice). You might find it to be slightly more antiquated and yellowed than it appears from the outside, but that also plays into the café’s charm. Trying to capture Myeongdong’s street food scene in one paragraph could never do it any justice. It is an ongoing dichotomy of all-time favorites such as the fried potato wedge craved on a stick, the strawberry mocha and the 32-inch ice cream as well as a battle for the current fear factor adventure. In the past few years, seafood has definitely been on the rise here with grilled eel, lobster, scallops and fried crabs served to you right in the middle of the street. (Truly, seeing a fish tank in the middle of Myeongdong’s street with eel swimming around is a sight for sore eyes.) Not all of it is fantastic, but we guarantee that you will remember eating it no matter what. Pro tip? Korean street food venders serving classics such as tteokbokki and soondae on Myeongdong 4-gil can be some of Korea’s worst. Do yourself a favor and find a chain-tteokbokki joint nearby! When you’re in the Myeongdong area, it can be tempting to shop all day and yes, we agree that the majority of what’s to do in Myeongdong is drop all your cash. However, when you run out of money, there are also some great landmarks to see and many of them are fortunately free. If being in Myeongdong has you a bit overwhelmed, you can start by heading over to the Seoul Global Cultural Center which is perfectly designed for visitors. 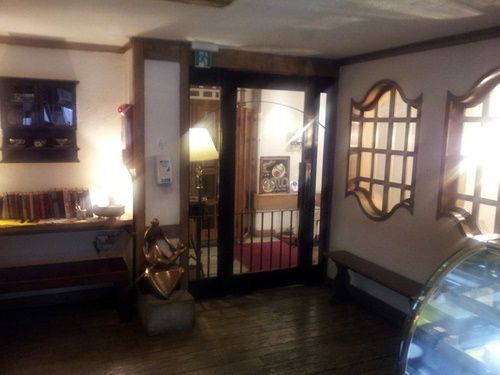 Here, you can talk to any of the friendly staff in English, Chinese or Japanese and even use free wifi in their lounge. The Cultural Center regularly holds events and seminars and they also have hanbok (traditional Korean clothes) for you to try on for free. You’ll notice Myeongdong Cathedral by the beautiful tower noticeable even from a distance and then by all the tourists who are outside taking pictures. Also known as The Cathedral Church of the Virgin Mary of the Immaculate Conception, the Cathedral has long been a landmark in the city. First opened in 1898, designated a historical site in 1977 and renovated in 2014, Myeongdong Cathedral was essential to developing Catholicism in Korea. Additionally, when the Cathedral underwent renovation, they added a large annex with an event hall. Occasionally small food markets are held here and there’s a bookstore, a few cafes as well as a small center for upcycling called RE:CODE for those interested in Seoul’s sustainable fashion scene. Myeongdong Cathedral also has a special Christmas mass many tourists seek out during the holiday season. A lesser-known place of worship among tourists in comparision to Myeongdong Cathedral, Youngnak Church’s history dates back to 1945 and the church is well-known for its efforts in reunification with North Korea. With several Gothic buildings at its location, it’s one of the few Presbyterian churches in Seoul to keep a more traditional aesthetic. They also hold an international worship every Sunday at 3:30pm in the Mission Chapel (except for holidays when service may be held elsewhere). Iconic to Seoul’s image, the N Seoul Tower (also called the YTN Tower, Namsan Tower and Seoul Tower) is a 480-meter tall white steeple located on Namsan Mountain. Built in 1971, the tower originally designed to catch general radio waves has been featured in dozens of films and dramas. 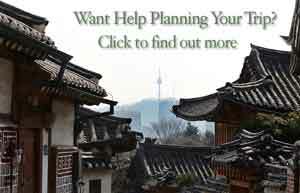 Today, a trip to N Seoul Tower is often considered essential to a Seoul tour. While there is a bus that rides up to the tower, many tourists prefer to walk up or take a cable car that provides a panoramic view of the city around the way. On the fifth floor, there is an observatory (also with a great view) that points you in the direction of several different countries. There are a variety of restaurants within the tower including the famous n.Grill on the top floor as well as a few souvenir shops, cafes and observation decks. You may consider the 10,000 won entrance fee for adults not worth the trouble, but being up where the tower is sure is nice. Seoul’s main post office is located right off the main streets of Myeongdong, across the street from Shinsegae Department Store. With its unique V-shaped building, the post office is one great place to see how efficiently the postal service here runs. The friendly workers are very willing to help you with your package or post cards and you’re able to ship large packages at a reasonable price. If you’ve bought something fragile and fear carrying it back, it might not be a bad idea to ship it via the post office. 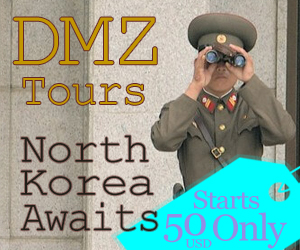 Truth be told, the Bank of Korea Money Museum is not necessarily Korea’s most visited museum. However, if you’re in the area and you’re interested in those dollar bills, this is one museum that might be worth the trip. You can learn all about the minting process and see 4,500 kinds of currency from all over theworld. The 3D Black Art Museum consists of three different halls– one dedicated to 3D Trick Art, 3D Black Art and 3D Illusion Art. If you’ve previously been to some of the trick eye museums, you’ll notice that a quite familiar theme runs within the works here. The “glow in the dark” aspect and the focus on attempting to give pictures a magical look might be a slight change from what you’re used to. Opened in 1999, this museum dedicated to illustration, animation, cartoons and children’s characters is a great peek into Korea’s thriving animation scene. There’s an exhibition hall outlining much of the above as well as a few rooms to experience making animation on your own. Film festivals and cultural events catered towards children are held here often. If you’re an adult, you might feel a bit awkward looking at the exhibits while children are here on field trips–but embrace the child within and you’ll be fine! The Grevin Museum is actually the fourth location of Musee Grevin, originally from France. Here, you can take pictures with the wax version of your favorite celebrities. Unique to Seoul are some Korean celebrities such as Psy, G Dragon and Kim Yuna and more. At times, it seems like there is no beginning and no end to shopping in Myeongdong. In the span of an hour, you can go from shopping for Hermes scaraves at Shinsegae Department Store where they house all the well-known brands to buying 5,000 won shorts from the outdoor racks set up by the local shops. Here’s the scoop on where to shop for what. Shinsegae Department Store can be marveled at from the outside as well as the inside. On the same location where Korea’s first department store (a Japanese endeavor named Misreukkosi) stood in the 1930s, this new luxury building was built in 2005 and then renovated in 2007. With a large fountain spouting water during warmer weather and Christmas lights up during the holidays, it’s great for a photo opt on both occasions. Inside, you can find all the brands from Tiffany’s to Dior as well as men’s, women’s and children’s apparel and an amazing food court. A popular location for tourists, you’ll find that the staff inside speaks a variety of languages–English, Japanese and Chinese. Several Korean accessory and stationary products hold a place on the first floor, and recently Flying Tiger from Copenhagen has also been a hit there. The sought-after Korean brand StyleNanda can be found on the second floor and here you can find the 3CE products all the fashion bloggers are raving about. Take time to explore some of the lesser known Korean brands on the other levels and you’ll find a variety of styles that won’t disappoint. Although the first floor H&M and ZARA sell products similar to what you might find back home, take the escalator up and you can find a variety of unique Korean styles. Some stores to be on the lookout for are Indi Brand on the 3rd floor and Kasina and Brown Breath on the 4th floor. The basement level also hides a Youngpoong Bookstore that hardly sells books anymore–check it out for some great stationery goods! Some of the best bargains you can get are along these two streets in Myeongdong. Where Myeongdong 4-gil and Myeongdong 8-gil almost intersect, you’ll find a variety of backpacks, accessories and handbags all at a great price. These accessories and bags are obvious fakes and not like the luxury fakes you might find in Itaewon, but 10,000 for an almost Mulberry? That’s a steal. Previously, the store-owners might try to hustle you if they see that you’re a tourist, but in recent years they have been legally required to write down their prices. Further north of the streets, there are a lot of options for women’s apparel as well as a few places that sell shoes. The prices of the shoes change with the seasons and a pair of cute flats for under 20,000 won can be found here during the summer. (Winter shoes? Totally not worth it.) Notice that while many of the racks seem to sell skirts, dresses and tops for 5,000 won to 10,000 won, the clothes inside might even be ten times the price. Do yourself a favor and please see the quality of the material as well as the stitching–not all of the clothing is worth the price. Many of the beauty brands such as Nature Republic, Etude House, Missha and Skinfood hold large stores here. If you’re going to go in anyways, milk the sample-ladies out front for all that they’ve got and don’t be tricked into buying more than you need. Sometimes, they make it seem like it’s mandatory to buy facemasks in packs but it is possible to purchase them individually. We never could find out why this multi-shop that focuses on Korean fashion brands has a Swedish name, but we do know that it’s definitely a shop worth visiting. Previously, both men and women’s fashion were housed in the same building but now they are two separate venues right across the street from one another. They sell everything from imitation jeans that are trending right now (today they’re cut-off flares) to high-end local brands. The top floor of the women’s Aland has a few vintage items and items on sale that are great buys for those to dare to dress boldly. 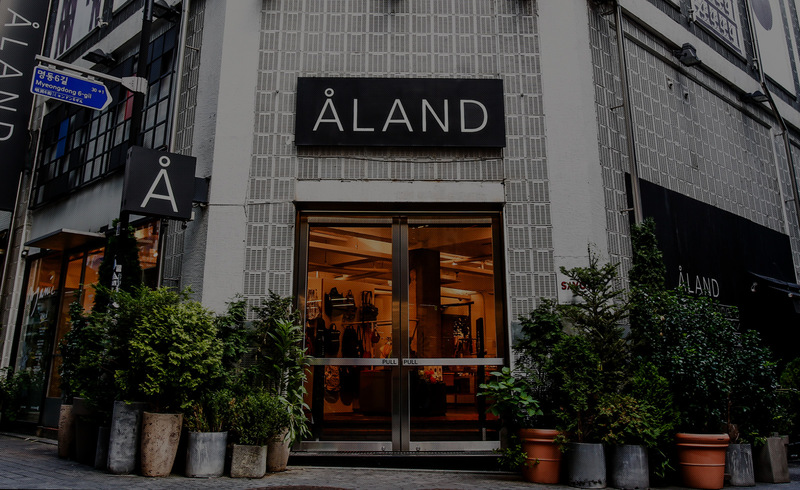 The entrance to the men’s Aland houses a great collection of shoes and accessories definitely worth taking a look at. If you’ve already packed in all your luggage, the bracelets, rings and earrings are always a small and affordable last-minute purchase to make! Now that you’ve fallen in love with this spicy, fermented dish – are you dying to know how it’s made? If you’re looking to learn first hand, the go-to place to turn to is the Seoul Kimchi Academy House. Here, you can learned from seasoned professionals proficient in several different languages how to spice up that cabbage. Since the National Theater of Korea was previously housed here, the location has a long history connecting it to art and theater. The current Myeongdong Art Theater opened in 2009 showcases musical and theatrical performances in a hall that fits approximately 600 guests. If you’re looking to watch a fun show while in Korea and not fond of watching shows in a different language, the Nanta Theater showcases programs perfectly catered to tourists who love food–and who doesn't love food? There is also an exhibition that runs in the lobby.